Most yarn processors sell their yarn in skeins or hanks. These are large loops of yarn that are made by winding them onto a skein-winder in various circumferences. Typically, these measure 1 to 2 yards in circumference (measured around the entire loop of yarn - not its diameter). However, knitters need their yarn wound into balls. The mills do not do this for a few reasons. First, they believe that the user can get a better "feel" for the yarn if it is not wound into a ball but rather is left in a skein. Most people feel that the yarn looks better in a skein because you can see the adjacent strands of yarn over a larger area. But another important reason is that the mills do not want to take the time to wind it into a ball! This means that the yarn shop will have to wind it into a ball for you or you can do it at home (if you have a ball winder). It is also possible to wind a ball by hand but this is tedious. So, knitters are the main reason that yarn needs to be wound into balls. Balls of yarn can be easily knit from whereas a skein or hank cannot. Tech Note: During 2012, we invented the Yarn Pet™ which enables a knitter to take a ball of yarn and mount it on the Pet in such a way that they never have to tug at their ball of yarn again. Users can also wind cones on our Ball Winder when using our Cone Winder Adapter Kit. This is a first for a ball winder. Users can wind balls with small center holes when using our Small Diameter Spindle. Kit makers prefer using our small diameter spindle because many kits normally include smallish balls which look better when wound on the Small Diameter Spindle. Yarn shops often times wind balls of yarn for their customers. Remember, the mills want to present their yarn in skeins and yet the knitter needs to have the yarn in a ball in order to use it. That is where the yarn shop comes in. 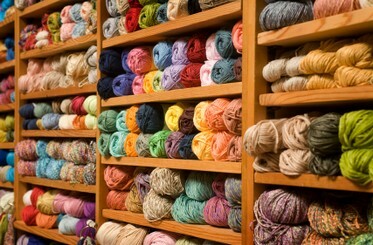 A smart yarn shop owner will have the necessary equipment to reliably wind balls of yarn for their customers. Let's face it, the happier a customer is with their purchase, the more likely they will be to buy more items from that retailer. Many knitters do not own ball winders. They depend on the yarn shop to provide that service. They eliminate the drudgery of manually winding a lot of balls. Staff can help customers while the ball is automatically winding. They do not have sick days or coffee/smoke breaks. They do require some minor maintenance but far less than a grumpy employee requires! They're neat to watch and the kids and guys love to see them work. Whether you use a manual or motorized ball winder, you are sure to enjoy the results of your labor as you unwind the yarn during the process of knitting. Ball winders are neat tools that do multiple things at the same time at relatively high speeds. Plus they have to handle different kinds of yarns and users which is not always easy.